Yesterday (Aug 29) I ran the 4 Mile Port Townsend XC Fun Run/ Trail Race, placing 6th overall in 25:50s. Like most trail races, this was not exactly an easy course to establish a rhythm-plenty of small rolling hills with a few longer, gradual ups and downs and some windy single track. I think I ran well and was at least competitive, unlike that Port Gamble Half 3 weeks ago. Looks like Ritz will be running the World Half Marathon Championships in England Oct. 11. Meanwhile, I have a hunch Solinsky and Tegenkamp will be back in Portland still trying to figure out where they went wrong. GET OUT THERE AND RACE! In case you haven't been following his career, Ritz has been marathon training the last few years under Brad Hudson. He made the US Olympic team and finished a commendable 9th in Beijing. Just a couple of months ago he switched over to Alberto Salazar's group, and has now turned in 2 fabulous races in a row. Clearly Salazar cannot take all of the credit- Dathan was is great shape prior to the move, and had a huge aerobic base behind him. All he needed was some sharpening, and the timing of his coaching change was perfect (sounds to me a lot like Ritz is following the Lydiard training bible by accident). My question is this- how fast would Dathan run in a marathon say, October. I have to believe that a 12:56 5K indicates a much higher level of fitness for Ritz at all distances including the marathon. If it were me, I'd be looking for a fast course like Chicago and see what happens. I have a hunch Salazar will be more patient and shut him down for the season. Too bad. MY COMMENT: Competitive running at this level is so far behind the other sports like baseball, football and basketball. Any exposure would be a plus. Alberto Salazar's comments on the stomach problems experienced by Kara Goucher during the World Championship marathon. MY COMMENT: I'm not sure eliminating carbohydrates is the answer, since that will also cause an eventual slowdown. If they expect to be competitive at a world class level, then they need to find a way for Kara to get fluid AND calories throughout the race. How about using alkaline water? Consider that when exercising you are consuming more oxygen and metabolizing energy through muscle work. This process creates free radicals, lactic acid, and a mild metabolic acidosis. Drinking alkaline, ionized, micro-clustered water may help ameliorate all three of these exercise-induced physiological end-products. Water that has been alkalized may help neutralize the exercise-induced acidosis. Alkaline water by definition contains alkaline forming minerals like calcium, magnesium, potassium and sodium. Water that has been ionized may help act as a free-radical scavenger to address the issue of accelerated oxygen consumption. Ionized water by definition has more negatively charged hydroxyl ions than tap or filtered water. Ionized water has the ability to give up these extra negative charges and may help act as a free-radical scavenger. Lastly, when water is micro-clustered it may be absorbed at a faster rate. This can help with general rehydration. -lifeionizers.com. To my knowledge there is only anecdotal evidence of health benefits from drinking alkaline water, but with Nike footing the bill what's the harm in trying? 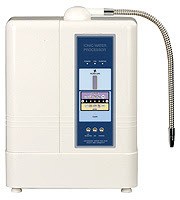 I happen to own a Jupiter Technos Water Ionizer and have been drinking alkaline water for several years now. Kenya has at least a couple dozen runners who could have won this marathon. Abel Kirui has 4 sub 2:08 marathons to his credit with a 2:05:04 marathon PR (Rotterdam- 2009). I also noticed that he ran 2:15:22 in oppressive heat and humidity at Singapore in 2006. Bai Xue's victory at the world championships was no fluke. According to her biography on IAAF, she ran 2:23:27 sec in 2008 and 2:25:15 in Berlin earlier this year. Check out the strong looking legs! She is 5'2" and weighs 106 lbs. However, a disturbing pattern began Sunday at the aid station at 10 kilometers (6.2 miles). A mile after she drank the fluid, it came back up with an acrid burp. It happened, at intervals, five more times and she didn't take her drink at the eighth and final opportunity. MY COMMENT: According to the article, Goucher was using "diluted Powerade mixed with electrolyte replacement gel". Strange. I wonder if she even tried taking in plain water. She had similar problems in New York last November. Tuesday night 5K Fun Run- I felt more comfortable than last week and ran progressive negative splits. 3 mile split was 17:53 compared to 17:49 last week. What is too young for running 50 miles? MY COMMENT: Honestly? I don't quite know what to think of this. I looked up the results- McKenzie Riford 11:57:06. What Would Pre Have Done Different? MY COMMENT: Congratulations to Teg and Solinsky for making the final, but the way they ran maybe they should have relaxed and enjoyed themselves a little more. Ask yourself, could Pre have lived like this without partying just a little? Having a good time, in moderation, would not have made a difference and may have even helped these guys. What's a tougher weekend- a 30 minute run followed up with a 2 hour run the next day, or back to back 90 minute runs? This weekend I chose the latter, thinking that recovery for my Tues 5K Fun Run might be quicker if I shortened up my Sunday run. I'll say this- my perception is that 3 hours of running spread over 2 days was not easy, and I'm not sure there was much difference in the way I felt today compared to the 2 hour runs I did the last 2 Sundays. We'll find out Tues if my theoy is correct. Evan Jager is living a dream. Just 20 years old, Jager ran the 5,000 in 13:22, fast enough to finish 3rd at the National Championships and earning a spot to represent the United States at the World Champioships Track and Field meet in Berlin, Germany. Not unexpectedly, Jager gave it his best in his heat but up against the best in the world failed to qualify for the final. Watching the race on universalsports.com, it was immediately apparent that when compared to the rest of the field, Jager has way too much wasted motion in his upper body. Watch this clip from a 3,000 meter race he did in Monaco. Maybe it's the hair bouncing around, but I think Evan could be a better runner if he worked on improving his running economy. I felt flat today, testament to the fact that you won't run your best interval workout every time out. You can see that today I peaked at #3 and could run no faster after that. I even used a 2 min recovery today- 90 sec. on Aug 6. Factors to consider are always lack of sufficient recovery from previous workouts and dehydration. Also for me, poor sleep is a distinct possibility. Not a bad idea to weigh yourself before these workouts to see if weight correlates to good or bad days. Looking at my times, I cannot complain- no worse than before, but down the road I'll eventually be looking for a breakthrough on this workout. Tues Aug 20: 60 minutes of easy running in Robin Hill, with the exception of 6 x up the killer Horse Trail Hill. Since I plan a hard interval session tomorrow, I tried not to work the hill too hard. It's tough no matter what speed I run. Everybody knows that during long runs, the farther you go, and the more carbohydrates you deplete, the more your leg muscles rely on fat as a primary source of fuel. Done on a consistent basis, your muscle cells adapt by becoming more efficient at burning fat. For this reason, marathon coach Greg McMillan suggests long steady runs up to 2.5 or 3 hours WITHOUT pre loading or taking in carbohydrates! "We want to deny the body carbohydrates in these runs so that the muscles will become better at sparing the carbohydrate stores, more efficient at burning fat and used to running with lowered blood glucose levels"
The potential problem with this advice is obvious- a lower level of performance. That's why McMillian also recommends a Fast Finish progressive type long run to simulate your actual marathon, where pre loading and regular intake of carbohydrates is encouraged. Feeling a little frustrated at my slow 5K times, I went to the age-graded calculator at runnersworld.com to gauge the effects of aging. To my pleasant surprise, using 56 years as my age (Aug 29), my most recent time of 18:18 translates to a 15:14, which is close to what I actually ran on the roads in my younger days. Using the McMillan Running Calculator, I am predicted to run a 2hr 58 min 24 sec marathon, close to my 2 hr 55 min run at Napa Valley in Feb. Wed Aug 19: Easy 1 hr 05 min run. Legs were very tired from yesterday's 5K. Probably should have skipped running today and gone for a bike ride. Sun Aug 16: 1 hr 56 min in Robin Hill on the trails. Clearly I paid the price in mile 3 for running the first 2 miles today 8 seconds faster than last week. Able to close the last 1/10 mile much faster today however. Now to figure out how to knock off another 20 seconds or so to get under 18 min. It's going to take some work. Barringer Runs 9:12 for 5th in the 3,000 Steeplechase! MY COMMENT: Jenny let the leaders get out a little too far, and down the stretch she closed as fast or faster than any of the women up front. She has the talent- I think she knows now she can run with the best and won't let them get away next time. Dathan Ritzenhein- 27:22 for 6th! MY COMMENT: Good interview- Ritz seems very happy with the changes implemented by Salazar- the lesson here is not to focus solely on "marathon training" at the expense of track speed. I recall Frank Shorter at his marathon peak running extremely well on the track. Ryan Hall needs to watch this interview. My money is on Ritz in their next marathon showdown- unless Hall starts showing something on the track or fall cross country. What's Going on at Nike? Let me get this straight. Alberto Salazar, one of America's best marathoners ever, coaches 10K runners Galen Rupp, Dathan Ritzenhein and Amy Yoder Begley, all members of the US team competing at the World Championships in Berlin. Another of his athletes, Kara Goucher (3rd in New York and Boston), is also a member of the team and is running the marathon. Salazar works directly for Nike- in fact they even have a BUILDING named after him. Recently it was announced that Alan Webb, American record holder in the mile, would be moving to Portland and Salazar would coach him. NIKE also recently hired Jerry Schumacher who brought a crew of professional runners to Portland. Schumacher's Group includes 3 guys representing the US at Worlds in the 5K, along with Shalane Flanagan, who won a bronze at the Bejing Olympics in the 10K and holds the American record in the 5K and the 10K. So you have 2 groups of runners, coached by 2 different coaches, all under the corporate umbrella of NIKE. Flanagan joined Schumacher, with the goal of making the transition to marathoning. A couple of his other athletes, Simon Bairu and Tim Nelson, also apparently have marathoning in their long-term plans. It's no secret that Flanagan has struggled since she arrived in Portland. She says she doesn't enjoy "being the only pony tail around here" and would love to train with Kara and Amy, so clearly they are "off limits". Flanagan wants to be a marathoner, and her new coach Schumacher, to my knowledge has never coached one (or even run a marathon himself for that matter). Salazar, who has never coached a miler/1500 meter runner at a world class level, has said he is confident "he can aquire the knowledge necessary" to coach Webb. If they haven't already, perhaps it's time for Al and Jerry (I envision their offices at NIKE across the hall from each other) to sit down and work something out. MY COMMENT: Not bad advice to hydrate the day prior, then 3 hours before the start gives you plenty of time to hit the bathroom before the race starts. 10 x 800 Intervals- Progressive Style! I came up with the challenge while running the first 800- how about trying to run 10 x 800 progressively faster? I had my doubts that I could do it, but what a great idea for teaching proper pace. I did 5 hard 800s on the flat trail last week, so I wanted to stay away from that kind of intensity today, hence the high number of repetitions done on the Robin Hill Trail. Very similar times, but looking back, I couldn't even do the cool-down on the 31st. Today the jog back to the car (approx. .75 mile)was slow and very comfortable. Workout times are not the only indicator of how well your workout went! Other than that one slip up running 2:54 on number 8, I was able to run each one progressively faster- yes I did sneak a peak at the watch at around half way and once more after that, but it's still not an easy thing to do. If you don't believe me, just try it! I got 3rd overall but that doesn't count the dozen or so guys that took a wrong turn and ran several extra miles or did not finish. Note that I hit 25 miles in 2:51 and surely would have broken 3 except I also went to wrong way- AFTER 25 MILES! Those were the days of small time marathons. Does Running Help or Ruin Knees? ...by moving and loading your knee joint, as you do when walking or running, you “condition” your cartilage to the load. It grows accustomed to those particular movements. You can run for miles, decades, a lifetime, without harming it. But if this exquisite balance is disturbed, usually by an injury, the loading mechanisms shift, the moving parts of the knee are no longer in their accustomed alignment and a “degenerative pathway” seems to open. MY COMMENT: This is good news if you've been running as long as I have (counting high school I ran my first race in 1968!) and have not suffered any significant knee problems. "It's not one size fits all. That's one of the problems we have is that people get hung up one type of training and everyone (if forced to) fit the mold and it doesn't work that way." "One problem with doing too much distance is that at a certain point, you deaden some of the sprint fibers and you lose your ability to sprint,"
Brock coaches Maggie Vessey, American 800 meter hopeful preparing for next week's World Championships who ran 1:57 earlier this year in Monaco. Mon- very easy 30 minutes the day following that Port Gamble Trail Half Marathon. Legs are fatigued but not beat up like a hard half on the roads. Tues- 5K Fun Run in 18:28. Splits were 6:03, 5:55, and 5:54. Good weather and I am starting to feel more comfortable. I can definitely run faster with somebody to chase (or chasing me). The researchers gave 219 women in eight-week basic combat training (BCT) either a placebo or supplements containing 100 mg ferrous sulphate. Since meat is a primary source of dietary iron, vegetarian athletes need to be particularly aware of this problem. As with other running problems, such as injuries, the best strategy is to avoid low iron in the first place. Good food sources of iron include: liver, lean meat, oysters, egg yolk, dark green leafy vegetables, legumes, dried fruit, and whole grain or enriched cereals and bread. 1. Eat 3 ounces of lean red meat or dark poultry a couple of times per week. 2. No coffee or tea with meals, because they reduce iron absorption. 3. Eat or drink vitamin C-rich foods with meals to increase iron absorption. 4. Use cast-iron cookware (particularly for acid foods like spaghetti sauce). MY COMMENT: The symptoms of anemia would be lethargy, fatigue easily, shortness of breath upon exertion, difficulty concentrating, and a rapid heart rate. No, you're not out of shape. But don't go experimenting with high dose supplementation without a proper diagnosis and medical supervision. Today I ran the Port Gamble Half, part of the Roots Rock Trail Running Series. As far as trails go, this was a race that offered a little bit of everything- flat dirt road, windy single track, sand, and some hills although nothing too extreme. I learned a couple of things right away. I thought I was in better shape. My combination of steady trail runs with occasional intervals could be improved upon- probably by going back to those weekly 17 milers, something I have not done since before the Oly Discovery Marathon. Hills are a real problem for me. I was getting dropped by the young guys on every uphill. Even worse, coming back on a relatively long steady downhill I had a group just fly by and disappear from sight. I just can't let myself freewheel downhills, particularly on trails. I am also lousy on narrow, single track windy trails. Again I kept getting caught by runner after runner on these sections. My final time was 1 hr 38 min, slow for a half, but on trail, about what I expected. This is a different sport than road or track racing. MY COMMENT: Can't disagree with these findings. Just don't get carried away! Lindsay Allen, a former Stanford runner, turned in a 9:40 steeple and 15:48 5K running for McMillianElite based in Flagstaff, Arizona. MY COMMENT: I never did drills or strides- wish I had. MY COMMENT: Webb has been in a slump going on 2 years now, so it's time for a change in scenery. Clearly Salazar thinks along the lines what others have been speculating for some time- "He won't touch a weight for the first six months. He has to lean out." I have just 2 questions- what did Webb weigh when he ran 3:46 and what does he weigh now (his bio on the USATF website lists Webb at 5'9" and 145 lbs.)? If I lose a pound of sweat, how much fluid volume do I need to drink to replenish that lost weight? Does water weigh more or less than sweat? Does it make a difference, in terms of volume, if I'm drinking a recovery drink versus water? A. There is an old saying, "A pint's a pound, the world around." Go to active.com for a more complete explanation. Tues Aug 4: 5K in 19:01. Mile splits 6:17, 6:05, 6:01. That first mile appears to be always slower- one short down and up hill to cross a creek, with the climb out in the first mile steeper than coming through from the other direction (mile 3). Still not very comfortable but at least I am running negative splits-always a good sign. My initial target on this course is 18:30. Wed Aug 5: easy 55 minutes on the trail. This brings back memories! I may have run more miles in Stevens Point than Chris- I went to UW-Stevens Point in the 70s and lived there another 5 years logging many year round 70-100 mile weeks. Sunday, Aug 2: 4 laps on the Robin Hill trail in 1 hr 56 min. Took a break after 2 laps for water and dried fruit, but this was encouraging compared to last week- I had to cut off the last steep hill and about 5 minutes of running time to finishing in 1 hr 57. This should be good preparation for a half marathon trail race I plan to do next Sunday in Port Gamble. Yoko Shibui of Japan (2:19:41 PR- 7th fastest all time), a favorite to win the marathon at the upcoming World Championships, won the San Francisco Marathon in 2 hr 46:34. Is 4 weeks enough time for her to fully recover and be ready? The Japanese are known for their long runs and high mileage, so a 2:46 should pose no problem for Shibui in 4 weeks time. In fact, there is some anecdotal evidence she may actually be stronger! Ever hear of the Marathon Manics? These people clearly have rewritten the standard guideline for marathon recovery (one day for every mile raced before your next race- so 1 month minimum between marathons). Test any of these manics 3 or even 2 weeks following a marathon and no doubt you'll see minimal if any after effects. I don't believe any of manics are challenging world class times, but that doesn't mean elite runners can't run marathons 4 weeks apart. Check out this bio on Mary Akor and note the dates on her string of marathons (Akor finished 19th in the 2008 Olympic Trials marathon). Most of her marathons run on 4 weeks or less recovery were faster. I've also experienced this the few times I've run them that close together. Running 26.2 miles does do damage, no matter how slow or fast you run, but when your muscle cells repair they may actually be stronger or more tolerant of the beating a marathon will give them. One final note: Shibui commented on the hilly San Francisco course, which can lead to even greater muscle damage relative to a flat course. It remains to be seen if this will translate to an even better race for Shibui in Berlin. If you don't know by now, I am a firm believer in spending a few minutes a day on various body weight strength exercises to supplement your running. It looks to me like for $50 more TheRack offers several more options than the Lebert Equalizer Bars, especially for targeting abdominals. I do like the Bars, however, for one paricular exercise that balances out pushups by working upper back (facing up, grabbing the bars and pulling up toward the ceiling) Order TheRack here for $159. Friday: Easy 30 minutes with Sumo, then another 55 minutes on the Robin Hill trails. A few strides after (trying to make those a new habit!). Sat: Easy 20 minutes with Sumo, then 2 x 1 mile on the 5K route I measured out. Completely flat with the exception of a creek crossing that includes a short 20 second downhill and back up the other side. Definitely slower than running on the flat (takes a good 30 seconds to get up to level ground). I did the first mile in 6:14, 5 min recovery, and ran it in 5:54 on the way back. I've been running so much trail this workout did not feel comfortable. I'll do the 5K on it again next Tuesday. Long trail run tomorrow! After a few weeks of 400s, I went back to the 8s in the trail at Robin Hill- the goal here was to number one finish the workout, number two stay comfortable the first 5, and number three run the last 5 progressively faster. Mission accomplished, but this was one tough workout. I walked most of the cool-down back to the car, a sure sign that I overextended myself on this one. I'm convinced that repeat 800s is the one workout that can boost fitness and racing ability (from 5K to the marathon) like no other.